Increased tensions across the country are causing people to think about how they relate to each other, even here in Concordia. That’s why the Concordia Neighborhood Association Board of Directors wrote a letter of support to community members. People from across Portland are talking more about how to support each other, and parents find themselves tackling tough subjects with their children. “You should’ve known we’ve got your back. It’s should’ve already been out there,” Ben Preacher tells his customers and friends. 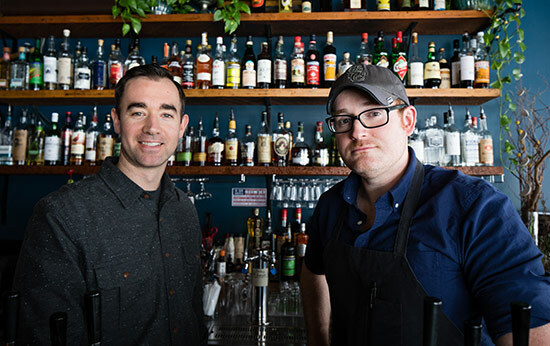 The Wilder Bar & Café publican believes people in the community have always supported each other and will help if anyone feels marginalized or that their safety is threatened. “In America, it’s impolite to speak of politics and religion,” Ben has learned in his six years in Portland. That’s the opposite of his native Ireland. He encourages his customers and friends to keep talking, and to join him engaging in political and social action. Customer and friend James Armstrong agrees. “We live in this progressive bubble out here and there’s a significant part of the country we don’t relate to.” He said he’s nervous about changes to come in social service and health policies, and he’s looking for ways he can make a difference. He’s concerned that won’t ebb. Children have fears too, according to Claire LaPoma Faubion Elementary School counselor and Trillium Family Services therapist. Children – and parents – have her ear and her shoulder daily. Children are like sponges, according to her, and they pick up on their parents’ concerns – and on their calmness. “The bigger picture stuff can feel pretty heavy to adults and to kiddos,” she said. “As adults, we have fully-cooked brains, reason and life experience to find our own sources of resiliency. Talking can be therapeutic – and it can lead to action. “We’ve always wanted to be known as the place you can talk about things,” Ben said of his neighborhood meeting place. And that was made evident by the dramatic shift in business in November. Neighbors sharing concerns and opinions filled Wilder. There’s already a somewhat formal start on sharing concerns on a citywide basis. A meeting in late November – dubbed “What Now?” – drew hundreds of people. Several human resources agencies in attendance reached out to individuals and other groups for volunteers, advocates and support. It may be too soon – in what’s been described as a divisive climate – for specific action to assure the safety of marginalized populations, healthcare and other issues on the political horizon. James, already active in local political issues, is keeping tabs on opportunities to help make a difference. “It’s a little bit of a no man’s land right now, with the accusations of Russia hacking the election and the country’s leaders being named. James Armstrong (left) and Ben Preacher find support in sharing concerns with others about increasing tensions in American politics and community life.